The International Atomic Energy Agency (IAEA) first publicly outlined its concerns about Iranian activities related to the development of a nuclear weapon in an annex to its November 2011 quarterly report on Iran's nuclear program. The report laid out 12 main areas for investigation, discussed in detail below. These issues became known as the possible military dimensions, or PMDs, of Iran’s nuclear program. The IAEA’s concerns about these activities pre-dated the public report, and little progress was made to resolve these issues until 2013. In November 2013, Iran and the IAEA announced a Joint Framework for Cooperation in which Iran agreed to take several steps to address the IAEA’s concerns, including providing information and access to research reactors and production plants. The IAEA added additional steps in 2014. Before Iran completed all of the steps, the 2013 Framework for Cooperation was superseded by the 2015 Roadmap for the Clarification of Past and Present Outstanding Issues regarding Iran’s Nuclear Program, which required Iran to provide information on all the concerns the IAEA had identified in the 2011 report. The 2015 Roadmap was announced concurrently with the nuclear deal concluded between Iran and the P5+1 (China, France, Germany, Russia, the United Kingdom and the United States). Sanctions relief in the nuclear deal was contingent upon Iran cooperating with the agency’s investigation. The IAEA released its assessment to conclude the Roadmap process in December 2015. The July 14, 2015 Roadmap laid out a schedule for Iran to address the IAEA’s concerns and the agency to complete its investigation. The IAEA announced on August 15, 2015 that Iran met the first deadline for providing documents and written explanations to the agency's questions regarding the 12 main areas for investigation as outlined in the November 2011 annex. The agency submitted follow-up questions to Iran on September 9, and on September 20, IAEA Director General Yukiya Amano and Deputy Director General Tero Varjoranta traveled to Tehran to discuss the investigation and visit the Parchin site. They confirmed that environmental samples were taken at Parchin for analysis in IAEA labs. On October 15, 2015, the deadline for additional responses, the IAEA confirmed that Iran had responded to its follow-up questions and completed all activities under the roadmap. The completed assessment, released on December 2, 2015, concluded that Iran had pursued a nuclear weapons program prior to 2003, including a coordinated “range of activities relevant to the development of a nuclear explosive device,” but did not divert nuclear material from its civilian nuclear program as part of its weaponization efforts. The report found that although Tehran’s organized nuclear weapons program ended in 2003, some activities continued through 2009. According to the assessment, the “activities did not advance beyond feasibility and scientific studies, and the acquisition of certain relevant technical competences and capabilities.” The agency said it found “no credible indications” that nuclear material was diverted to the weapons program or that any undeclared activities have taken place since 2009. In several areas, like nuclear testing preparations and fuzing, arming, and firing a payload, the IAEA did not receive any new information. In other areas, such as Iran’s work at a uranium mine, the IAEA assessed that Tehran’s activities were consistent with its declaration to the IAEA. However, the IAEA assessed that Iran’s program structure, computer modelling of a nuclear explosive device, and certain types of experiments with detonators were part of a nuclear weapons development program prior to 2003. Following a meeting on December 15, 2015, the 35-member IAEA Board of Governors voted unanimously to close the investigation into Iran's past weaponization work while continuing to report on Iran's implementation of the July 2015 nuclear deal with the P5+1. Iran's ambassador to the IAEA Reza Najafi said that Iran "disagreed" with some of the agencies findings, arguing that the “scientific studies of dual-use technologies have always been for peaceful civilian or conventional military uses” rather than nuclear weapons work, he said. Program management structure: The IAEA assessed that, prior to 2003, Iran had an organized structure “suitable for the coordination of a range of activities relevant” to nuclear weapons design. The activities that continued beyond 2003 were not a coordinated program. Procurement activities: The IAEA had “indications” that Tehran attempted to purchase items relevant to developing a nuclear weapon prior to 2007 and information that Iran purchased materials for its fuel cycle activities through companies not affiliated with the Atomic Energy Organization of Iran. Iran admitted to looking into procuring a high speed camera for conventional purposes, but said it ultimately did not do so. Nuclear components for an explosive device: The IAEA had evidence that Tehran had access to documentation on the conversion of uranium compounds to uranium metal, which is part of the weaponization process, and made progress on reducing a uranium compound into a metal form. Tehran denied that it conducted any metallurgical work for weapons purposes. The IAEA’s final assessment found no indication of Iran conducting activities related to the uranium metal document. Detonator development: The IAEA assessed that Iran’s work on explosive bridgewire detonators have “characteristics relevant to a nuclear explosive device.” The agency found that some of Iran’s explanations, that the detonators were developed as a safer alternative because of explosive accidents, were “inconsistent” and “unrelated” to the IAEA’s timeframe for detonator development. Hydrodynamic experiments: As part of its investigation over the past several months, IAEA officials were able to visit Parchin, a military site where the agency suspected that Tehran conducted hydrodynamic tests in an explosive chamber. Since the IAEA requested access in 2012, Iran conducted extensive construction and renovations. Tehran said in September 2015 discussions with the IAEA that one of the main buildings in question was used for storing chemicals for the production of explosives. Environmental sampling at the site found “chemically man-made particles of uranium” but did not indicate that it was used for long-term storage of chemicals as Iran claimed. The IAEA assessed that its satellite imagery analysis and environmental sampling “does not support Iran’s statements on the purpose of the building” and that Iran’s activities at the site impeded the agency’s investigation. The IAEA did not draw a definite assessment as to what occurred at Parchin. Modelling and calculations: The IAEA assessed that Iran conducted modelling and calculations related to nuclear explosive configurations prior to 2004 and between 2005-2009. During the agency’s investigation between August-October 2015, Iran maintained that it was not in a position to discuss its work on hydrodynamic modelling because it was for conventional military purposes and not an IAEA concern. The IAEA noted in its report that there are conventional applications for such modelling, and that the calculations derived from the modelling were incomplete and fragmented, but assessed overall that Iran conducted computer modelling of a nuclear explosive device between 2005-2009. Conducting a test: The IAEA noted it has not received any additional information regarding Tehran's plans to conduct a nuclear test since its November 2011 report. The IAEA noted in the November 2011 report that Iran may have undertaken “preparatory experimentation” relevant to a nuclear weapons explosive device and obtained a document on the safety arrangements for explosive nuclear testing. Integration into a missile delivery vehicle: The IAEA assessed that two of the workshops it identified in 2011 as producing components and mock up parts for engineering of a Shahab-3 (Iran’s medium-range ballistic missile) re-entry vehicle for a nuclear warhead exist, and that the capabilities are “consistent with those described” in documentation provided to the agency on Tehran’s work on a re-entry vehicle. Fuzing, arming, and firing system: The IAEA report noted in the Final Assessment report that it had not received any new information since the November 2011 report on development of a prototype firing system for a Shahab-3 payload that would allow the missile’s payload to safely re-enter the atmosphere and then explode above a target or upon impact. Prior to reaching the July 2015 roadmap, the IAEA and Iran had taken some steps to clarify the outstanding issues between 2013-2014. Under the November 11, 2013 Framework for Cooperation, Iran and the IAEA committed to resolve the agency's concerns through a step-by-step process to address all of the outstanding issues. An annex to the framework laid out the first six actions that Iran pledged to take within three months (see details below). On February 9, 2014, Iran and the IAEA announced a further seven actions that Iran would take by May 15, 2014 (see details below). Iran completed the initial two sets of actions within the time period specified, all of which fall into one of the 12 main areas of investigation. In June 2014, IAEA Director General Yukiya Amano said that the agency would not issue an assessment on any action until the investigation was completed and the agency could assess the information gathered as a system. A May 20, 2014 meeting resulted in an agreement on an additional 5 actions to be taken by August 25, 2014 (see details below). Iran completed three of the five actions by the end of August 2014. Two remaining issues related to nuclear weapons development remained unresolved. Iran and the IAEA met several times throughout the spring, and in its May 29, 2015 quarterly report, the IAEA noted that Iran shared information on one of the outstanding issues related to nuclear weapons development. Before all of these actions were completed, this agreement was superseded by the July 2015 Roadmap. The full text of the initial Framework for Cooperation and its accompanying annex is available here. The detailed steps taken under the original framework are laid out below. Iran facilitated IAEA access to the Gchine uranium mine on January 29, 2014. The IAEA visited the Heavy Water Production Plant at the Arak site on December 8, 2013. In a February 9 joint statement, the IAEA and Iran announced that Iran completed the actions agreed to on November 11. Clarification of the announcement made by Iran regarding additional enrichment facilities. Providing mutually agreed relevant information and managed access to the Saghand mine in Yazd. An IAEA team was provided access to the Saghand mine on a May 5-6 visit to Iran. Providing mutually agreed relevant information and managed access to the Ardakan concentration plant. An IAEA team was provided access to the Ardakan plant on a May 6 visit to Iran. Submission of an updated Design Information Questionnaire (DIQ) for the IR-40 Reactor (Heavy Water Reactor at Arak). In its March 20 report on the Joint Plan of Action, the IAEA noted that Iran completed an updated DIQ for the agency on February 12. Iran provided follow-up information in response to the agency's questions about the DIQ on March 29. Taking steps to agree with the Agency on the conclusion of a Safeguards Approach for the IR 40 Reactor. 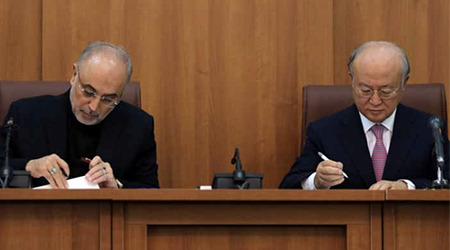 Iran and the IAEA met on May 5 to continue work on the safeguards for the IR-40 reactor at Arak. The approach is not yet completed. Providing mutually agreed relevant information and arranging for a technical visit to Lashkar Ab’ad Laser Centre. The agency was able to visit the center on March 12. Providing information on source material, which has not reached the composition and purity suitable for fuel fabrication or for being isotopically enriched, including imports of such material and on Iran’s extraction of uranium from phosphates. Iran provided this information to the IAEA in an April 29 letter. Providing information and explanations for the Agency to assess Iran’s stated need or application for the development of Exploding Bridge Wire detonators. Iran provided the IAEA with information on the detonators at a meeting on April 26 and in subsequent letters on April 30 and an additional May 20 meeting. Exchanging information with the Agency with respect to the allegations related to the initiation of high explosives, including the conduct of large scale high explosives experimentation in Iran. In its May 29, 2015 quarterly report, the IAEA noted that Iran shared information on one of the outstanding issues related to nuclear weapons development. Providing mutually agreed relevant information and explanations related to studies made and/or papers published in Iran in relation to neutron transport and associated modelling and calculations and their alleged application to compressed materials. Providing mutually agreed information and arranging a technical visit to a centrifuge research and development centre. According to the Sept. 5 IAEA quarterly report, IAEA inspectors were able to visit this facility on Aug. 31. Providing mutually agreed information and managed access to centrifuge assembly workshops, centrifuge rotor production workshops and storage facilities. The Sept. 5 IAEA quarterly report said that the agency was able to access these sites Aug. 18-20. Concluding the safeguards approach for the IR-40 reactor. The agency and Iran completed the safeguards approach on Aug. 31, six days after the Aug. 25 deadline. Note: this factsheet was previously titled "Implementation of the Iran-IAEA Framework for Cooperation"
The Treaty on the Prohibition of Nuclear Weapons prohibits the use, threat of use, development, production, manufacturing, acquisition, possession, stockpiling, transfer, stationing and installment of nuclear weapons or assistance with any prohibited activities. It requires states-parties to declare if they once had or currently have nuclear weapons and if there are nuclear weapons on their territory. It requires states-parties that currently have nuclear weapons to destroy them and those that have nuclear weapons on their territory to remove them. States-parties must also provide victim assistance to those impacted by nuclear weapon use and testing and environmental remediation assistance to areas impacted by nuclear weapon use and testing. What is a Nuclear-Weapon-Free Zone? A nuclear-weapon-free zone (NWFZ) is a specified region in which countries commit themselves not to manufacture, acquire, test, or possess nuclear weapons. Five such zones exist today, with four of them spanning the entire Southern Hemisphere. The regions currently covered under NWFZ agreements include: Latin America (the 1967 Treaty of Tlatelolco), the South Pacific (the 1985 Treaty of Rarotonga), Southeast Asia (the 1995 Treaty of Bangkok) Africa (the 1996 Treaty of Pelindaba) and Central Asia (the 2006 Treaty of Semipalatinsk). Initial efforts to create an area free of nuclear weapons began in the late 1950s with several proposals to establish such a zone in Central and Eastern Europe. Poland offered the first proposal-named the Rapacki Plan after the Polish foreign minister-in 1958. The Rapacki Plan sought to initially keep nuclear weapons from being deployed in Poland, Czechoslovakia, West Germany, and East Germany, while reserving the right for other European countries to follow suit. The Soviet Union, Sweden, Finland, Romania, and Bulgaria also floated similar proposals. All these early efforts, however, floundered amidst the U.S.-Soviet superpower conflict, although the Rapacki Plan would serve as a model to the nuclear-weapon-free zones that were eventually set up in other regions of the globe. Article VII of the nuclear Nonproliferation Treaty (NPT), which entered into force in 1970, affirms the right of countries to establish specified zones free of nuclear weapons. The UN General Assembly reaffirmed that right in 1975 and outlined the criteria for such zones. Within these nuclear-weapon-free zones, countries may use nuclear energy for peaceful purposes. Each treaty establishing a nuclear-weapon-free zone includes a protocol for the five nuclear-weapon states recognized under the NPT-China, France, Russia, the United Kingdom, and the United States-to sign and ratify. These protocols, which are legally binding, call upon the nuclear-weapon states to respect the status of the zones and not to use or threaten to use nuclear weapons against treaty states-parties. Such declarations of non-use of nuclear weapons are referred to as negative security assurances. For more information, see Nuclear Declaratory Policy and Negative Security Assurances. However, the five nuclear-armed countries have at times signed and ratified a NWFZ protocol and declared conditions reserving the right to use nuclear weapons in certain scenarios against parties to a nuclear-weapon-free zone. For instance, the United States signed the protocol for the African nuclear-weapon-free zone in April 1996 with a declaration that it would reserve the right to respond with all options, implying possible use of nuclear weapons, to a chemical or biological weapons attack by a member of the zone. None of the nuclear-weapon states have signed the relevant protocol for the treaty creating a zone in Southeast Asia because of concerns that it conflicts with the right of their ships and aircraft to have freedom of movement in international waters and airspace and problems with the definitions of territory, since includes exclusive economic zones and continental shelves. The other three zones do not explicitly rule out the transit of nuclear weapons by nuclear-weapon states through the zones, and the general practice of nuclear-weapon states is not to declare whether nuclear weapons are aboard their vessels. In addition to nuclear-weapon-free zones, there are treaties and declarations, which are not covered by this fact sheet, banning the deployment of nuclear weapons in Antarctica, Mongolia, on the seabed, and in outer space. Duration: The treaties are to remain in force indefinitely. Yet, each treaty includes a withdrawal option for states-parties. With the exception of the Treaty of Tlatelolco, which simply requires three months' advance notice before a withdrawal can take effect, all the NWFZ treaties require 12 months' advance notice for a state-party to end its treaty obligations. Conditions: None of the treaties can be subjected to conditions by its non-nuclear-weapon states-parties. Verification: Each state-party adopts comprehensive safeguards administered by the International Atomic Energy Agency (IAEA), which verifies that states-parties are not pursuing nuclear weapons illicitly. The Central Asian NWFZ goes a step further in requiring that states in the region adopt the IAEA's Additional Protocol, which provides for expanded monitoring. Territory Covered: Each zone applies to the entire territories of all of its states-parties. Territory is understood to include all land holdings, internal waters, territorial seas, and archipelagic waters. The Latin American treaty also extends hundreds of kilometers from the states-parties' territories into the Pacific and Atlantic Oceans, but the nuclear-weapon states, citing their freedom at sea, assert that this does not apply to their ships and aircraft that might be carrying nuclear weapons. A dispute also exists over the inclusion of the Chagos Archipelago, which includes the U.S. military base at Diego Garcia in the Indian Ocean, as part of the proposed African nuclear-weapon-free zone. Neither the United States nor the United Kingdom recognizes Diego Garcia as being subject to the Pelindaba Treaty. None. Five nuclear weapons states and ASEAN members met in July 2012 to sign the treaty protocol. The treaty commission, however, postponed the signing of the protocol until November, requesting more time to review reservations that several of the NWS indicated that they would attach during ratification. 1. The treaty specified that the full zone would not enter into force until it was ratified by all states within the zones. That did not occur until Cuba ratified the treaty in 2002. However, the treaty permitted individual states to waive that provision and declare themselves bound by the treaty, which many did beginning in 1968. 2. Russia is recognized as inheriting the Soviet Union's treaty commitments. Sen. Tom Cotton (R-Ark.) and Rep. Joe Wilson (R-S.C.) introduced legislation on Feb.7 to “restrict” funding for the CTBTO. The bill will be offered as a floor amendment by Wilson to the House version of the National Defense Authorization Act, which is being considered this week. Unfortunately, a small but influential group of Republican lawmakers are seeking to cut U.S. funding for the Comprehensive Test Ban Treaty Organization (CTBTO) and undermine international support for the Comprehensive Test Ban Treaty (CTBT) and the global nuclear test moratorium. Sen. Tom Cotton (R-Ark.) and Rep. Joe Wilson (R-S.C.) introduced legislation on Feb.7 to “restrict” funding for the CTBTO. prompt other states to restrict their funding for the CTBTO or possibly withhold data from CTBTO monitoring stations that are based in their territory, thus undermining the capabilities of the system to detect and deter clandestine nuclear testing. We believe that all States should maintain all existing voluntary moratoria on nuclear weapon test explosions or any other nuclear explosion, and those States that have not instituted such moratoria should do so. The verification regime being established by the Preparatory Commission for the Comprehensive Nuclear-Test-Ban Treaty Organization, in particular the International Monitoring System and International Data Centre, has proven its effectiveness by providing substantive and reliable data on the nuclear tests conducted by North Korea. We strongly encourage all interested States to complete the IMS as a matter of priority. The proposed Wilson amendment also seeks to undermine the U.S. obligation—as a signatory to the 1996 Comprehensive Test Ban Treaty—not to conduct nuclear test explosions. The amendment calls on Congress to declare that the September 2016 UN Security Council Resolution 2310 does not “obligate…nor does it impose an obligation on the United States to refrain from actions that would run counter to the object and purpose” of the CTBT, which President Bill Clinton signed in 1996. The G7 Foreign Minsters’ April 11 Joint Communique—endorsed by Tillerson—also “recalls" UN Security Council Resolution 2310 as an important contribution to the effort to ensure all states that have signed the CTBT do not go back on their promise not to conduct nuclear weapon test explosions. However, if Congress were to assert that the United States is not required to respect our obligations as a CTBT signatory not to conduct nuclear test explosions, it would signal to other states that that the United States may be seeking to back out of its commitment to a global and verifiable nuclear test ban and is considering the resumption of nuclear testing. That’s not a smart move. With North Korea threatening to conduct a sixth nuclear test explosion, it is essential that the United States reinforce, not undermine, the global nuclear testing taboo. *This sentence was updated July 17, 2017 to reflect that the House amendment by Wilson was adopted by a voice vote. The formal adoption of the first legally binding global treaty prohibiting nuclear weapons possession, use, and threat of use was greeted with widespread approval from the international community, with the exception of the nuclear-weapon states and their defense treaty allies who dismissed the accord as irrelevant and even potentially dangerous. On July 7, 122 non-nuclear-armed states voted to adopt the Treaty on the Prohibition of Nuclear Weapons following four weeks of talks at a special UN conference. Supporters hailed it as a new tool to strengthen norms against nuclear weapons use and said it can, in tandem with the nuclear Nonproliferation Treaty (NPT), discourage other states from seeking to obtain nuclear weapons and spur further action on nuclear disarmament. “After many decades, we have managed to sow the first seeds of a world free of nuclear weapons,” declared Costa Rican Ambassador Elayne Whyte Gómez, president of the conference. The Netherlands, the only NATO ally participating, voted against the treaty, and Singapore abstained. No nuclear-armed state participated, and the United States actively opposed the effort. The treaty has provisions governing how nuclear-weapon states could join the treaty, verifiably giving up their arsenals, although treaty supporters recognized that is not likely to happen anytime soon. “We hope that today marks the beginning of the end of the nuclear age,” Beatrice Fihn, executive director of the International Campaign to Abolish Nuclear Weapons, said in a July 7 statement. The effort and outcome united individuals such as Setsuko Thurlow, a survivor of the U.S. bombing of Hiroshima, and former U.S. Defense Secretary William Perry, who oversaw the U.S. nuclear force under President Bill Clinton. “Though the treaty will not have the power to eliminate existing nuclear weapons, it provides a vision of a safer world,” Perry said in a July 7 statement. A note of discord emerged as the negotiations concluded. The Netherlands called for a vote, instead of allowing adoption by consensus. The Dutch delegates explained that the treaty was incompatible with its obligations as a NATO member, had provisions that are not verifiable, and could undermine the NPT. Singapore abstained after provisions it sought were not adopted. This agenda “includes a commitment, consistent with the NPT, to seeking to ease tension and strengthen trust between states in ways that will help reduce nuclear dangers and offer the best hope of fulfilling the NPT’s objectives,” he said. The treaty has a 24-paragraph preamble acknowledging the catastrophic humanitarian consequences of nuclear weapons use and the value of existing international disarmament agreements, including the NPT, the Comprehensive Test Ban Treaty, and nuclear-weapon-free-zone agreements, as well as the right of states-parties to peaceful nuclear energy applications. States-parties are prohibited to use, threaten to use, develop, produce, manufacture, acquire, possess, stockpile, transfer, station, or install nuclear weapons or assist with any prohibited activities. Non-nuclear-weapon states are required to have, at a minimum, a comprehensive safeguards agreement with the International Atomic Energy Agency (IAEA). A state-party must declare, when joining the treaty, whether it has eliminated a previous nuclear weapons program, currently has nuclear weapons, or holds anther country’s nuclear weapons on its territory. In the latter case, it must remove them when it signs the treaty. A nuclear-weapon state can accede to the treaty and eliminate its nuclear weapons in one of two ways: it can join the treaty and then destroy its nuclear weapons, or destroy its nuclear weapons and then join the treaty. States that “destroy and join” must cooperate on verification with a “competent international authority” to be designated in the future. States that “join and destroy” must immediately remove nuclear weapons from operational status and submit a time-bound plan for their destruction within 60 days of joining the treaty. The treaty requires any current or former nuclear weapons state that seeks to join the treaty to conclude a safeguards agreement with the IAEA to verify that nuclear materials are not diverted from peaceful to weapons purposes. The treaty also obligates states-parties to provide victim assistance and environmental remediation to those affected by nuclear weapons use and testing. Biennial meetings of states-parties will address implementation and other measures. Review conferences will be held every six years. The treaty enters into force 90 days after the 50th state ratifies it. The treaty underwent significant revisions during two sessions of often constructive but at times contentious negotiations. Language on declarations, safeguards, and treaty accession by nuclear-weapon states was the most heavily revised, largely for precision and clarity. The biggest debates centered on whether to include controversial language on prohibitions and strengthening safeguards re­quirements. Whyte Gómez chose not to incorporate contested proposals into the final text in order to conclude a treaty with broad support. The failed measures include a proposal supported by Cuba and Iran for additional prohibitions on financing and transit of nuclear weapons, which Brazil and Mexico opposed. Sweden and Switzerland pushed for stronger safeguards requirements, specifically a reference to the IAEA Model Additional Protocol, but Brazil opposed making mandatory a previously voluntary agreement. There was a last-minute debate on July 5 about removing the clause that permits withdrawal from the treaty, which Whyte Gómez ultimately decided to retain. Supporting states hailed the achievement, even as many dele­gates acknowledged the treaty is only a step toward nuclear disarmament. The treaty “lays the foundation,” but adoption is “just the beginning,” Ambassador Thomas Hajnoczi, Austria’s permanent representative to the United Nations Office at Geneva, said in a statement after the vote. The negotiators agreed to set 50 ratifying states as the threshold for the treaty’s entry into force, but they recognized the accord will have greater normative weight with the more states that join. Although most of the 122 states that voted to approve the treaty will likely sign this year, the ratification process will be more time consuming, especially if the major nuclear-armed states seek to dissuade key states from ratifying.